We are on the flight heading home listening to the girls giggling! It's a beautiful day outside and we understand the weather is warming up at home! Dad has being doing a lot of reading on homeopathic and things to give Emily with hopes of getting rid of this NB! We have gone back to completely organic food again, dropping red meat, and making things from scratch and eating a lot more organic fruits and vegetables! Some things that he read and found to have helped, we are adding to her regimen but they are natural so it never hurts! Obviously with the DFMO Emily is not able to eat many things with polyamide but she seems to be doing really well with that but is read to be able to eat other things! Our trip to Michigan was short but long with lots off anxiety and fear of what we would hear. Emily's energy is unbelievable right now which is amazing and we are enjoying every bit of it, watching her dance, laugh, run and play!! This is energy we haven't seen in 2 years and we are loving it. Her weight is at 31 lbs which is the first time since diagnosis 2 years ago she has been over her diagnosis weight, yeah Emily. Even if only over by a pound it is still the first time and we are happy to take that, the more energy and food the mor she has to fight. Tuesday Emily had her port accessed and injection of MIBG isotope. I noticed after they gave it to her it was really quick and I even commented on it but she indicated that she received the amount required per her weight and height. Scans were scheduled for the next day over 24 hours which we know before they always wanted them within 24 hours! Wednesday Emily had her scan and as always Emily sits perfectly still and has no problems! 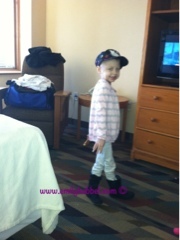 This time during the scan she listened to Justin Bieber and Katy Perry and was happy and content with listening to it! This little girl always seems to amaze us! We are always so proud of her! Afterwards she had her counts checked and VMA/HMA and LDH checked and then she was deaccessed. Her platelets are 43 so still hoping to get those up but everything else looks great! We enjoyed an afternoon of down time in the family room of the Renucci House of making a home cooked lunch and just hanging out! It was nice to be away from the room and just hang out! Later we met up with Brooke and Jessica and spent a good 3 hours with them, with the girls playing and us just hanging and talking! It was nice! This morning came so quick and we were nervous! Thank you to everyone who texted and emailed! Your love and thoughts go a long way and we certainly appreciate them! Dr Sholler went over the scans and basically her scans from about 3 weeks ago are stable! So thankfully that means No new disease, and some of it appears to be decreasing in uptake and other places appear to have more uptake! The newer spots appear to have more uptake! As of today we are heading home with them working on scheduling scans for first week of February coming back in a month. There was notes in the scans report that there is a patchy spot which is in the soft tissue going over to bones that could or could not be disease with , she didn't feel it was at this time and that it notes these areas would need follow up! So she indicated scans in a month would be a follow up to that but she didn't "think" it was disease! While Doug and I expected more progression , we are "ok" with stable! But we aren't happy with increased uptake in the newer areas and concerns of other things! Right now, we don't want to give NB a flying chance in hell to grow anymore than what it is and then take over and we have no control! Thankfully Dr Sholler is happy for Emily to continue to have scans in Michigan if we decide to go another route! One of our biggest concerns besides the growth of this disease and Emily's well being is doing scans back at home and getting false information from the scan like we did in August of last year! Our home doctors has a plan of what he feels will be best and Dr Sholler has a plan of what she feels will work! Doug and I haven't made sound decisions at the moment just because we would like to go over the most recent scans with Dr Gowda and get his opinion again! Dr Sholler will also be looking into a vaccination trial that we were talking to her about! We still have a lot of fears for tomorrow and what could come, making decisions as to what is best for our daughter is definitely overwhelming! It's pretty painful actually because if side effects but Emily has so much fight left in her and with her getting stronger we know whatever we decide that Emily can handle it! Please remember to always hug and love your kids as much as you can! Will update more as we know more. We have safely made it home, again thank you to the wonder Wings of Mercy and all they do!!! Thank you for the update! Stable is good but still pressing in for NED. I will be praying for God to give you direction on the next steps. I have heard that cinnamon fights cancer. You can buy it organically. Another good thing is your local honey. Not honey from the store, because you don't know exactly where it comes from, but from your local bee keeper. Local honey mixed with cinnamon and made as a tea is very good for the health. You can even mix it half and half with milk, it is very nummy.